Throughout the Orient, especially in India, Sri Lanka, Thailand, and Burma (all ancient gemstone producers), special importance has always been given to certain combination gemstone talismans. the most well-known of these are the NAVA-RATNA (9 gems), SAPTA-RATNA (7 gems), PANCHA-RATNA (5 gems), and the TRI-RATNA (3 gems). For countless centuries, the cultures of India and South-East Asia have revered the beautiful 9 gem talisman known as "Navaratna". Combining the gemstones representing each of the nine planets in sidereal astrology, the navaratna is esteemed by ancient tradition as a bringer of good fortune through its favorable influence on the planetary energies. 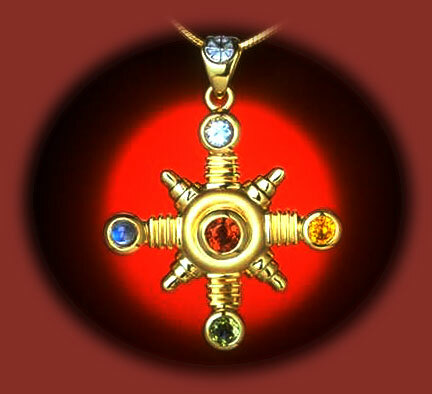 The most well-known design places a ruby, representing the sun, in the center encircled by the other 8 planetary gemstones, diamond for Venus, pearl for Moon, coral for Mars, hessonite for Rahu (the moon's ascending node), blue sapphire for Saturn, cat's-eye for Ketu (the moon's descending node), yellow sapphire for Jupiter and emerald for Mercury. kurvantu sarve mama su prabhatam"
"I invoke the Supreme Deity who is creator, maintainer, and destroyer of the universe, and the deities presiding over the Sun, Moon, Mars, Mercury, Jupiter, Venus, Saturn, and the shadow planets Rahu and Ketu - May they bestow their benediction upon me." 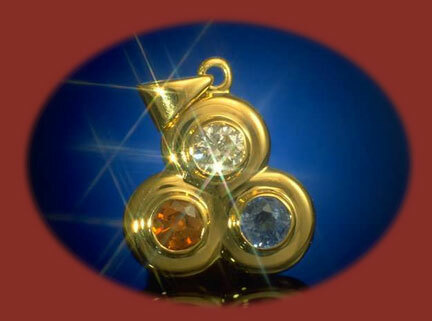 The seven jewels talisman, combines the gems which correspond to the planets ruling the seven days of the week. Every day of the week is governed over by a specific planet. In many languages the days are named directly after the planet that rules over them. In English we must simply examine the Anglo-Saxon origin of the names of the days to see the correspondence. Sunday (Sun), Monday (Moon), and Saturday (Saturn) still remain intact. In practically every other language from Hindi to Thai from Sanskrit to French the weekdays are directly named after their ruling planet. The Sapta-ratna should be used as 7 different rings or pendants to be worn successively on each corresponding day of the week. This practice is still popular in India, especially among astrologers, royal families and wealthy people. 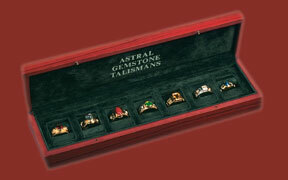 The Collection pictured above belongs to a private collector...it is seven planetary rings set in an exotic wooden box with a solid gold name plate using solid gold screws. The plate says, "Sri Sapta Ratna." 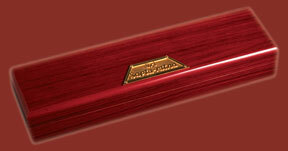 We can custom make special collections of flawless gems such as pictured above anytime on request. Price (investment) is up to YOU! 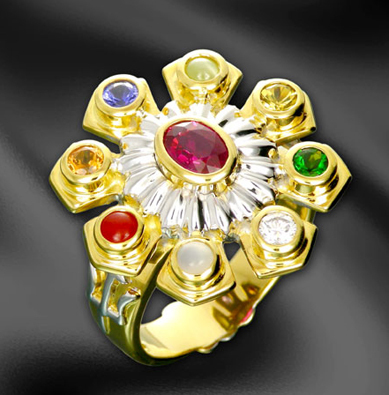 (five jewels) combines the gemstones which represent a balance of the five (5) material elements recognized throughout Asia, i.e., EARTH (Bhumi), WATER (Jala), FIRE (Agni), AIR (Vayu) & SPACE (Akasha). Thus earth is represented by the influence of the planet Mercury in emerald or other natural green gems, water by the influence of the Moon in natural pearl or moonstone, fire by the influence of the Sun in ruby or other natural red gems, air by the influence of the planet Jupiter in yellow sapphire or other natural yellow gems, and space by the influence of the planet Venus in diamond or other natural colorless gems. A talisman believed to balance the 3 constituents of one's material body, crudely translated as marrow, mucus and air. These are represented by the 3 primary cosmic colors in nature -- red, yellow and blue, or ruby, red coral and yellow sapphire. In conclusion, we must again point out that gemstones selected for astrological and talismanic use should be flawless (eye clean), as defective stones are considered a source of misfortune. 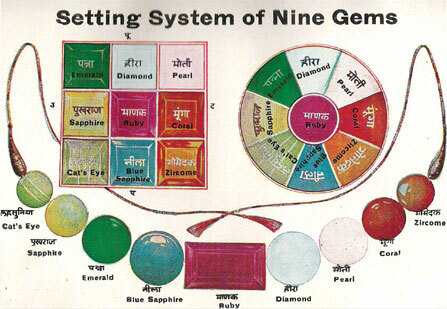 According to Vedic authority, the qualities of fire (color) and water (clarity) are the most important factors in choosing gems which are pure transmitters of benign planetary influence. Sun - Moon - Jupiter - Rahu - Mercury - Venus - Ketu - Saturn - Mars ---Click here to go directly to the Planet of your choice.